LotusTalk - The Lotus Cars Community > Marketplace > Aftermarket Suppliers > Introducing the gPAN3! 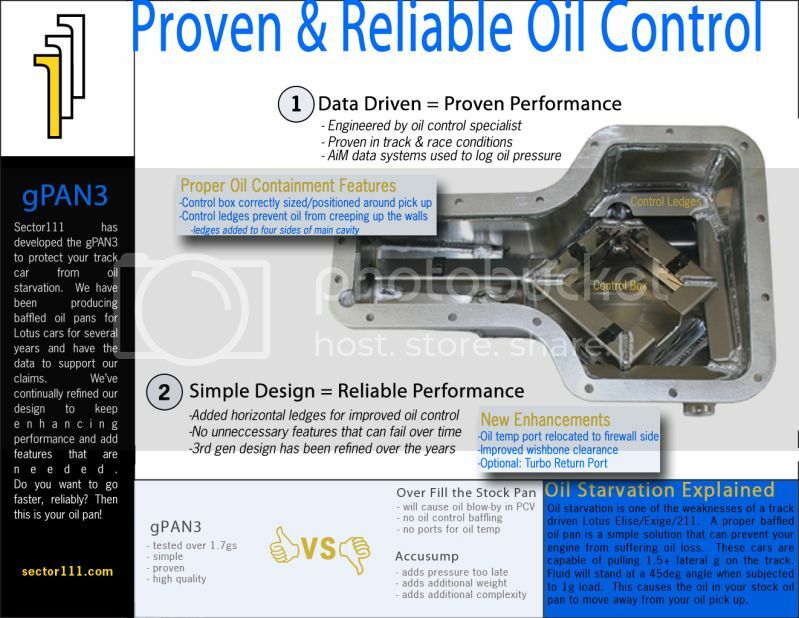 Continuing with our constant improvement of our gPAN baffled oil pan solution, we are proud to announce our newest version, the gPAN3! Even more good news! At $525, this new design will be the same price as our gPAN2! Thanks for looking, and please feel free to contact us with any questions! So for those of us that just upgraded to the gPan2 design a few months ago is there anything to worry about with the old design? I'm currently running on slicks and getting 1.7 lateral G so I'm really concerned with oil starvation (pretty sure that's what killed my last motor). Nice to see you guys continuing to innovate. Any trade up policy for my NIB gpan2 that I haven't installed yet? Absolutely nothing to worry about with the gPAN2. It is an excellent product with data to prove how well it works. This is just an improvement in that design.